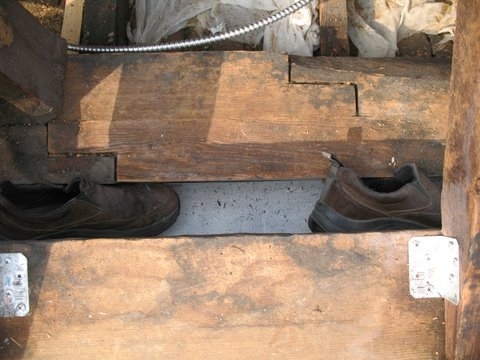 Since we removed the original concealment shoe we found up there during our roof restoration, we needed a replacement. After all, we wouldn’t want bad luck or evil spirits to take advantage of our lack of protection. Executive Director Carter Lively was, after much prodding, convinced to place a pair of his much-loved shoes in the cornice to guarantee that the house stays safe for another 237 years. When the cornice on the northeast side of the wing was removed last week, the roofers found several items stashed inside it. 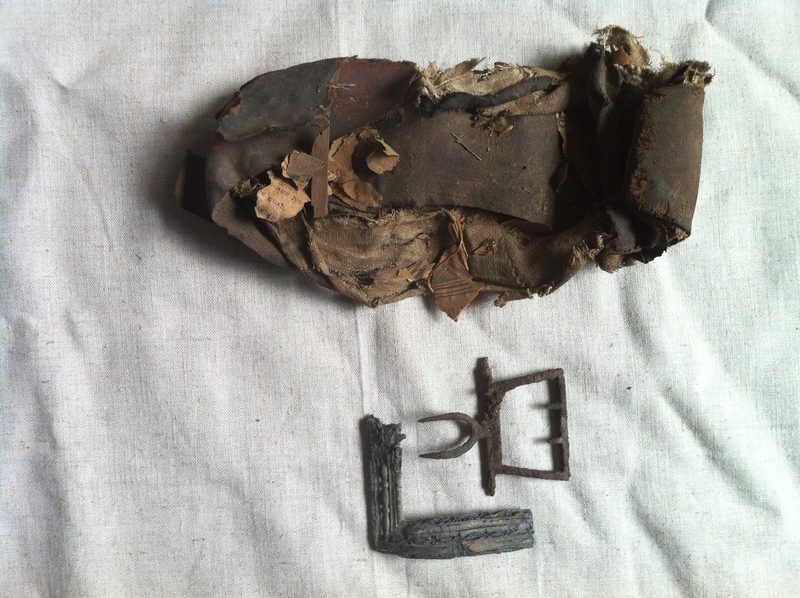 The most intriguing were a shoe and buckle that may date to the original construction of the house in 1774. As you can see in the picture below, the shoe currently consists of a leather sole with bits of the outer leather and inner linen layers of the shoe still attached. The buckle apparently broke in half at some point, so we have a complete inner lache but only half of the outer rectangle. Staff, docents, and roofers all came up with their own theories on just how a shoe could have ended up sealed in a cornice, but our speculation ended when an astute trustee alerted us to an old custom of concealing shoes inside a home during construction or renovation. These shoes are called, appropriately, “concealment shoes,” and the practice was so common in Britain that the Northampton Museum has a concealed shoe registry. It’s believed that people as far back as the 14th century thought that concealed shoes would ward off evil spirits and bring good luck. They are often found near chimneys, perhaps because evil spirits would enter through the highest point of the house, as well as near other access points like doors and windows. The shoes are usually well-worn, and are more likely to have belonged to children or women than men. Our shoe seems to fit these descriptions: it was found in the roof, definitely looks to have been worn, and wouldn’t have been longer than about eight inches. The shoe and buckle will be added to our permanent collection so that we can preserve and share this story, and we may just ask our Executive Director to seal one of his shoes in the roof to ensure that Hammond-Harwood House will have good luck for years to come.